Curious about our tasting tours? We’ve been recommended by The New York Times, USA Today, Time Out, David Lebovitz and Ruth Reichl, and you can read below what some of our wonderful clients have said about their experiences. Be sure to check out our calendar of upcoming food & wine tours or just send us an email with any questions. Hope to see you soon! What an afternoon! Our group (of strangers) gelled instantly and the mood lightened quickly as comfortable small talk filled the gaps between the laughter and more serious moments of our St Germain Food Tour…Along the way we met a diverse range of characters who owned or worked in the small shops…And all of them took their business of food seriously; examples of the best in their business…Diane’s keen knowledge in food, acquired by years in the food industry and food journalism ensured the matches of food and wines were precise and hit the spot…Thoroughly recommended by all who attended, including our teenage boys! A Paris highlight! “I couldn’t think of a better way to spend 3 plus hours on a Saturday afternoon in Paris. Aaron’s kind temperament and personal passion for wine was a thrill to be around. The group all shared the interest to discover the hidden treasures of the 11th arrondissement . My first tour of the Marais the previous year was so excellent I thought why not do it with wine this year. As a solo traveler in Paris don’t hesitate to sign up! 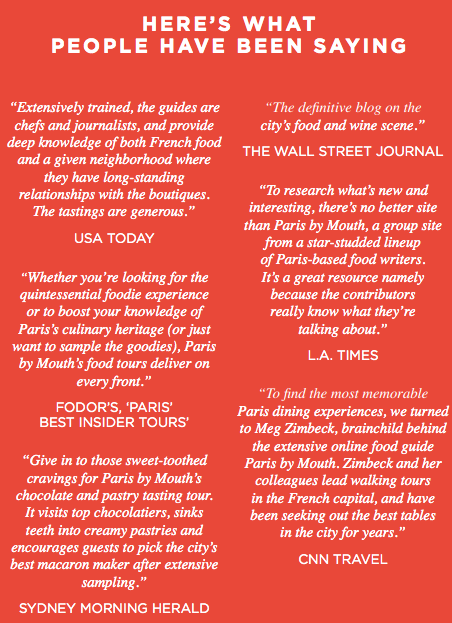 If you are into food and wine and interested in learning about the best Paris has to offer, I highly recommend Paris by Mouth. I did two tours – The Tour of the Left Bank with Diane and the Wine and Cheese Extravaganza with Meg, highlights of my Paris stay. I was blown away by the command of the subject and non-pretentious, engaging style of ‘teaching’ that both these women displayed, which made these small group experiences feel more like time hanging out with friends and enjoying good food/wine rather than a superficial hospitality event. I stayed in Paris for a month, and Paris by Mouth became one of my most important resources for the best in food and wine. I highly recommend you check them out! We absolutely LOVED the Taste of the Latin Quarter tour with Meg–one week ago! Meg of course was outstanding, the group was small and intimate, and the choices of places to visit was outstanding! Everything was wonderful–and the opportunity to enjoy all of our purchases at a small end of walk “picnic” made this a highlight of our trip to Paris! We have friends leaving for Paris soon–already they are looking into booking a tour! I forgot to say that Catherine was our guide! Catherine I’m sorry! You were wonderful as were all our food stops along the way. I will certainly book another tour with PBM if [when] I return to Paris.